In an auditorium filled with family, friends and supporters, Evan Davis shared how he didn’t speak until he was six-years-old. But now, “they say I won’t STOP talking!” Davis, 28, was one of five Special Olympics Nebraska athletes who completed the Athlete Leadership Program, culminating in the graduation ceremony at Gallup in Omaha where they delivered their first speeches. The Special Olympics Athlete Leadership Programs (ALPs) allows athletes to explore opportunities for participation in roles previously considered “non-traditional.” Special Olympics Nebraska partners with Gallup to train and mentor athletes to become leaders in their schools and communities. 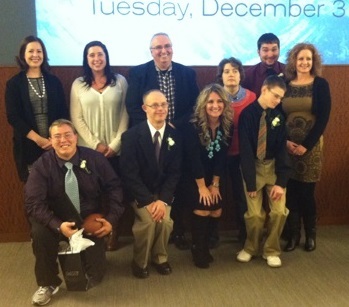 ALPs graduates become self-advocates, often sharing their stories in community groups, at Special Olympics events, and sometimes even on Capitol Hill advocating on behalf of the intellectually disabled population. Evan Davis of Elgin was joined by fellow graduates Shelby Brettman, Martin Hall and Wyatt Spalding, all from Fremont, and Andrew Kline of Papillion. Under the coaching of their mentors, the new graduates shared messages of overcoming challenges, the importance of family and friends, and goals for the future. The Athlete Leadership Program wouldn’t be possible without the dedication of each athlete’s mentor who donates their time and expertise to fine-tune each graduate’s message. The mentors this year were: Scot Caldwell, Beth Delaney, Samatha Harper, Candice O’Neil, Kelli Winkler and Jane Wood-Bennett.